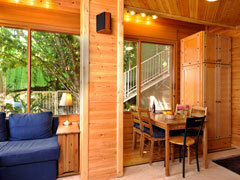 Romantic wood cabin, luxurious and elegant, with shaded private yard & deck porch facing the breathtaking panorama. 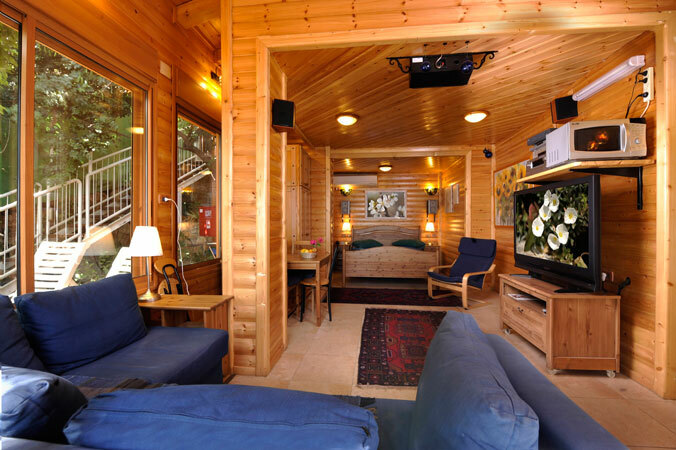 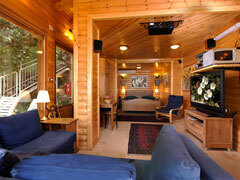 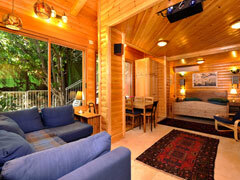 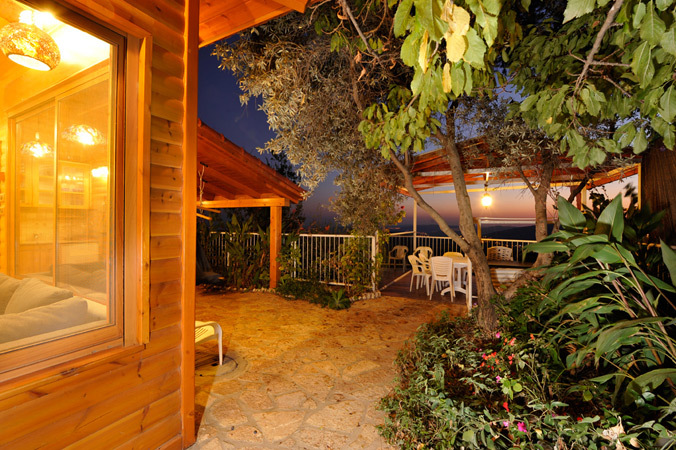 A very spacious and scenic luxury wooden cabin overlooking a gorgeous view. 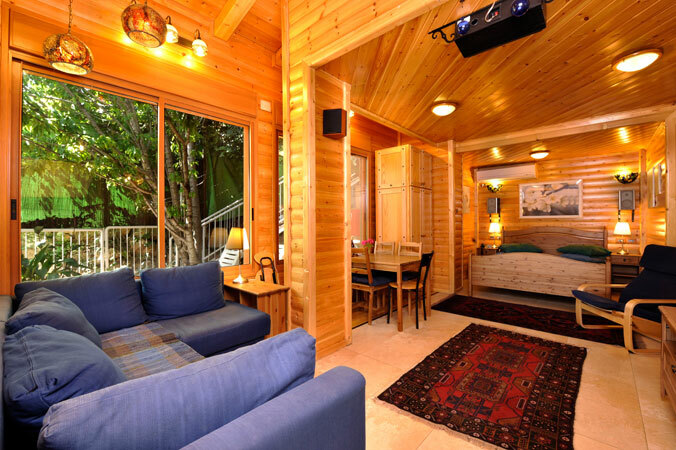 This studio unit has a large wooden floor space combined with porcelain tiles, a romantic sleeping area, and a living area with a sofa which converts into a double bed for 2 children, a single sofa which converts into 1 bed, and a mattress for a fourth child. 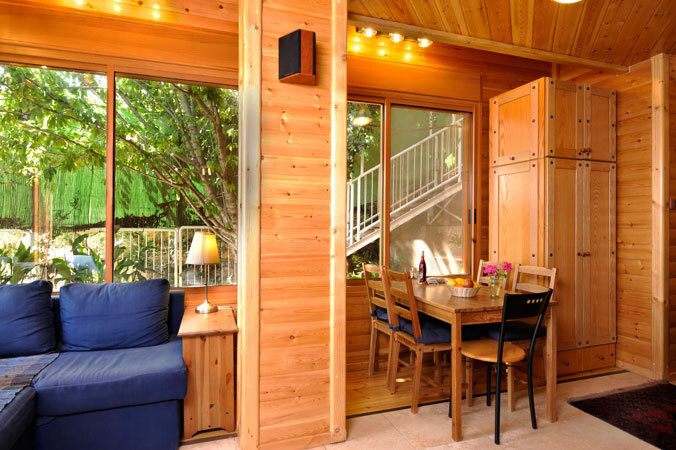 Kitchenette, dining area and double jacuzzi face the view. 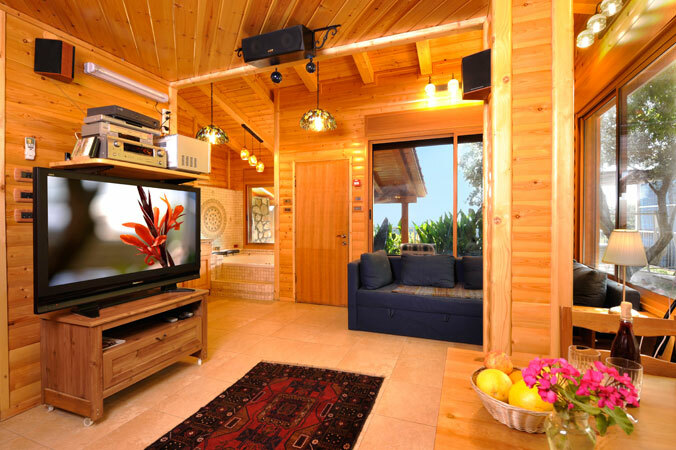 There is a Home Theater TV HD System, an AC system for independent heating/cooling, and a wardrobe. 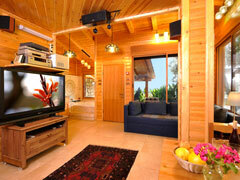 TV addicts can view the screen from every corner. 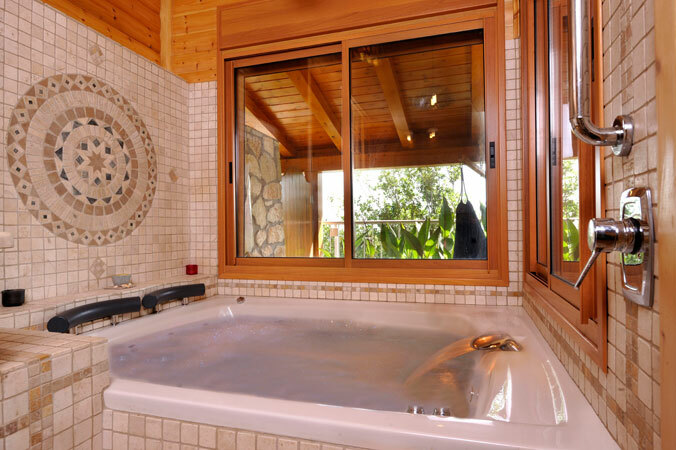 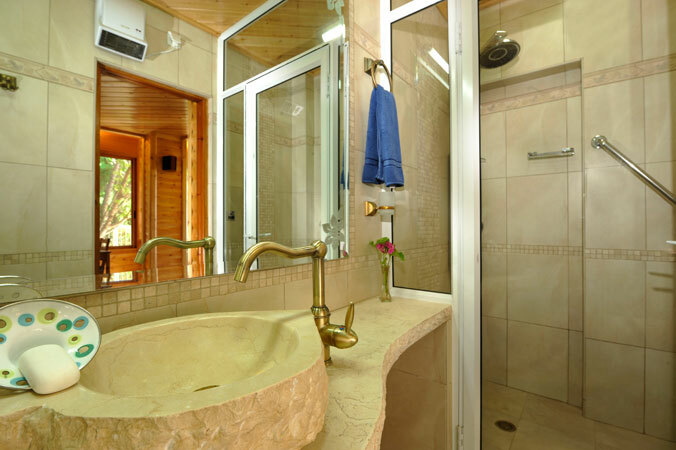 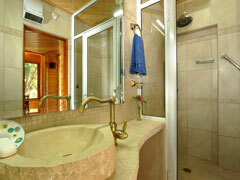 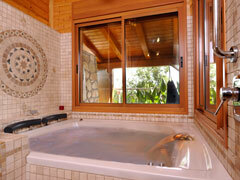 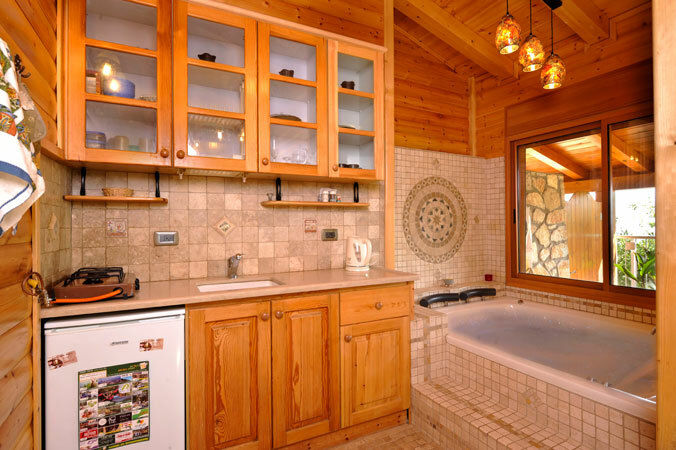 A stand-up jacuzzi jet shower and a marvel bench for the wet sauna are in the bathroom. 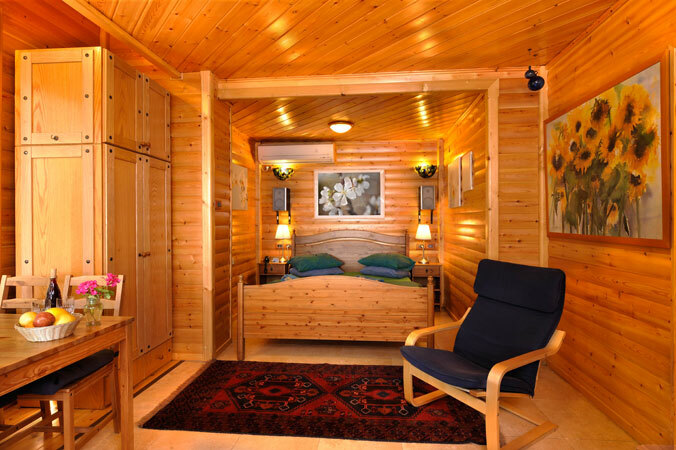 The woodwork is based on rounded Finnish pine logs. 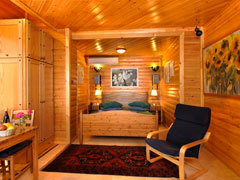 Suitable for a romantic couple or family with 1-3 children. 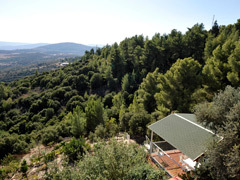 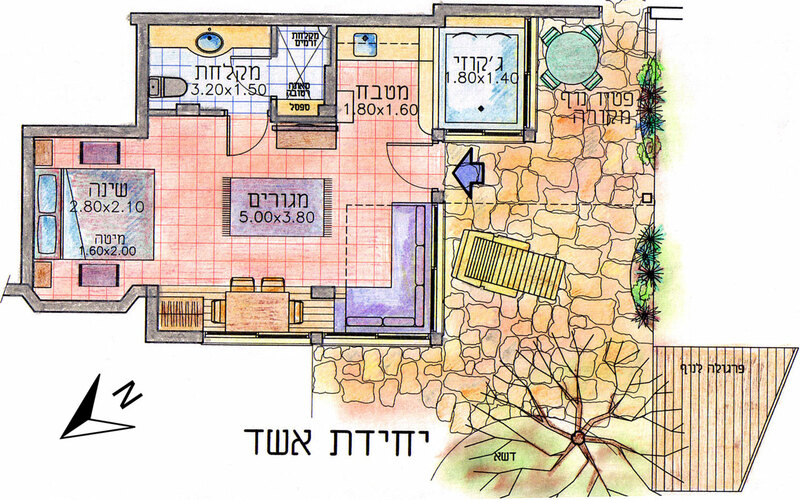 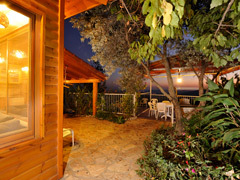 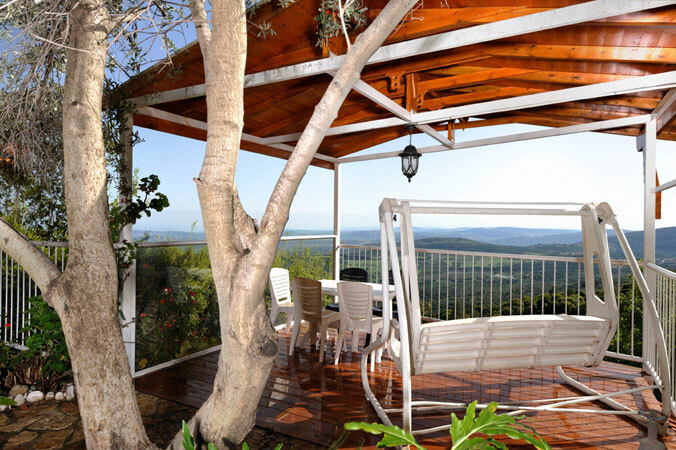 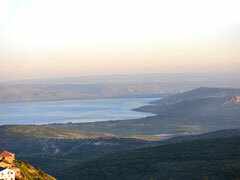 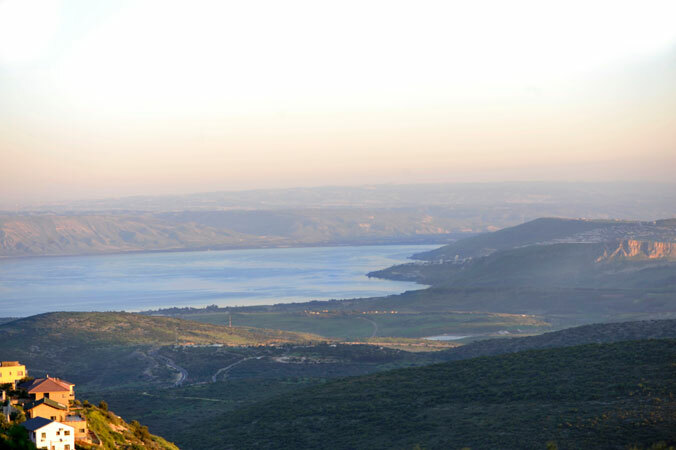 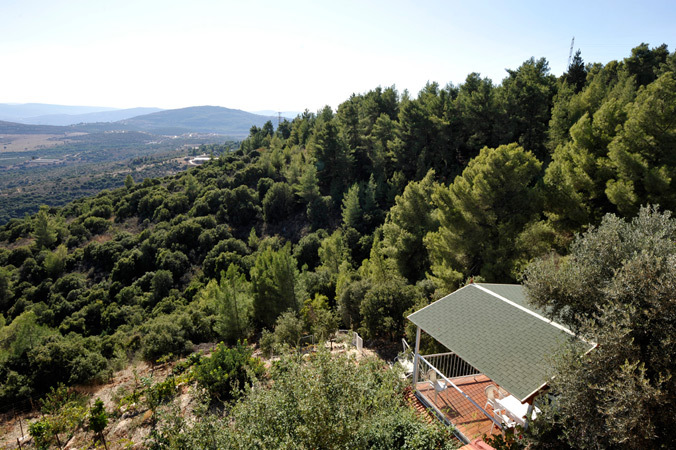 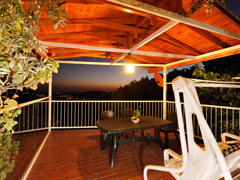 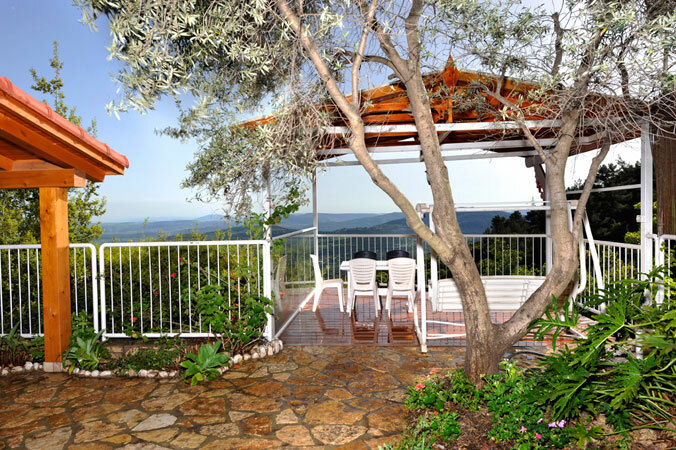 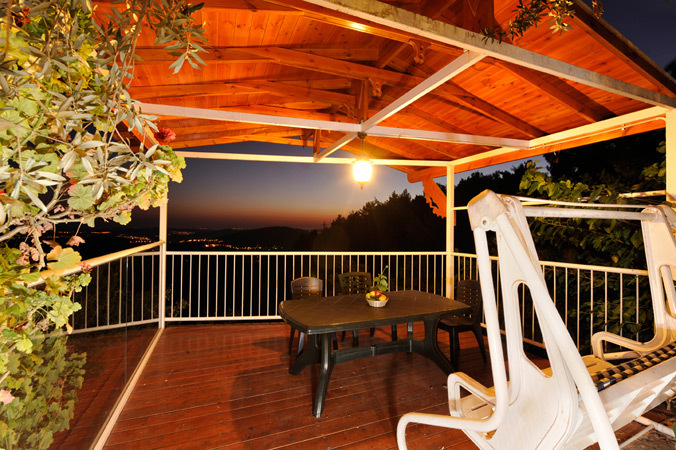 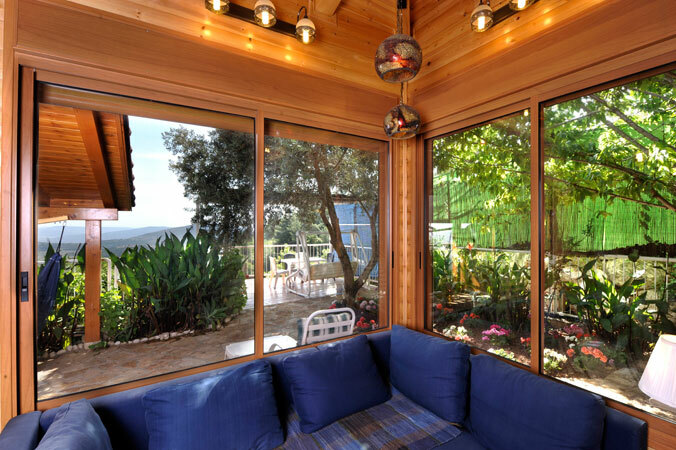 From a very private panoramic wooden-beamed & flagstone-paved shaded patio, and a shaded deck porch, one can view the Galilean Hills, Lake Kinneret and the Golan Heights. 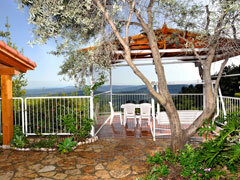 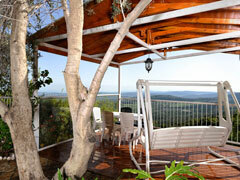 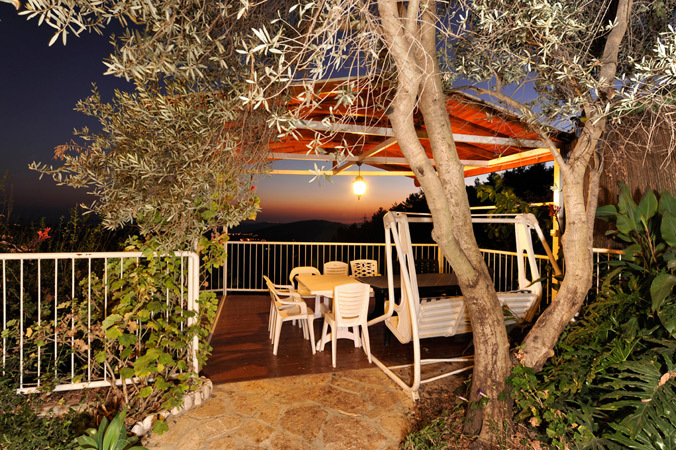 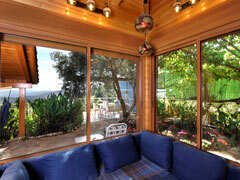 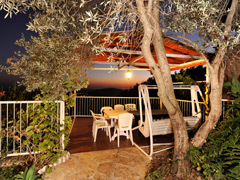 The patio is shaded by an olive tree and has a double swing and hammocks.